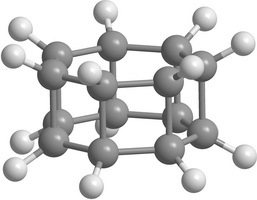 Carbon [n,m]prismanes (polyprismanes) can be regarded as stacked layers of dehydrogenated cycloalkane molecules, where m is the number of vertices of the closed carbon ring, and n is the number of layers. 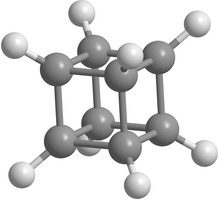 The polyprismanes' ends are passivated by hydrogen atoms to avoid the dangling bonds. For large n polyprismanes represent single-walled carbon nanotube analogs with an extremely small cross-section as a regular polygon. Nevertheless, unlike carbon nanotubes, polyprismanes have rectangles on their surfaces instead of hexagons. So, the angles between covalent C-C bonds are different from the value 109.5° usual for the sp3-hybridized carbon orbitals. 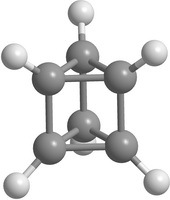 Only "simplest" polyprismanes representatives are currently obtained: [2,3]prismane C6H6 (Ladenburg's prismane), [2,4]prismane C8H8 (hydrocarbon cubane) and [2,5]prismane C10H10. Unfortunately, attempts to synthesis [2,m]prismanes starting from [2,6]prismane C12H12 failed. Some of the elementary polyprismanes are figured below. Figure 1. Some elementary [2,m]prismanes with m = 3 - 8. Prismanes (a), (b), and (c) are sucessfully synthesized. NTBM model predicts the stability loss as the number of vertices m increases. Detailed information is resulted in Table 1. Table 1. 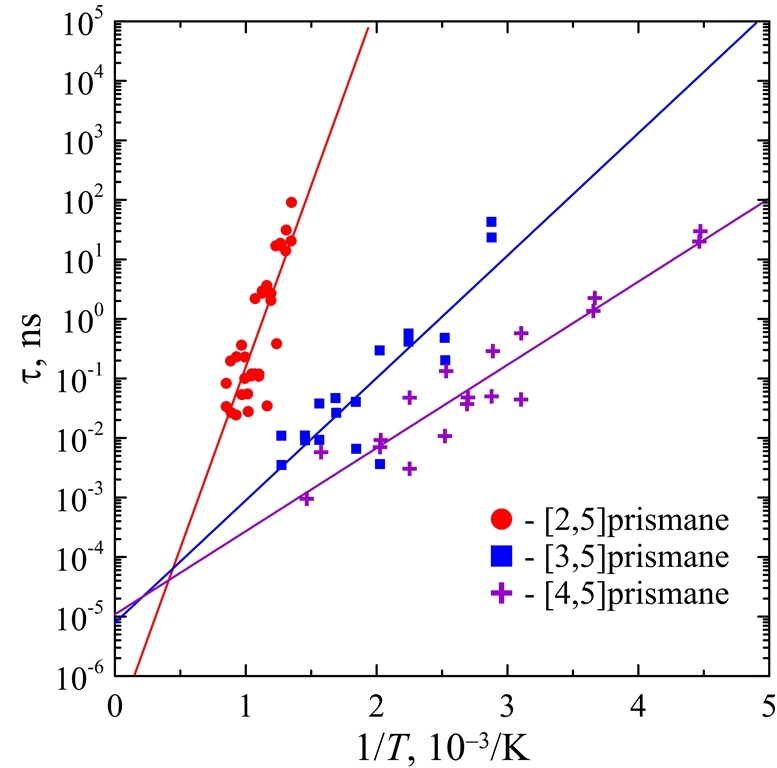 Minimum heights of the energy barriers U to the decay of some elementary [2, m ]prismanes. 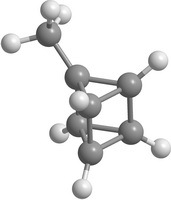 Here l TS is the bond length between the carbon atoms of the ruptured C–C bond for the saddle configurations. The length of the ruptured bond l TS also decrases as m increases (again, except the Ladenburg's prismane ). One of the main ways to stabilize the molecular structure is the radical substitution. Some hypothetical substituted prismanes are shown on Figure 2. "Substituted" means that in the prismane one or more hydrogen atoms are replaced by functional groups or radicals. Unfortunately, in the case of [2,m]prismanes radicals (namely, CH3, NH2 , and NO2 chemical groups) do not stabilize the carbon cage. On the contrary they reduce the stability. As an example in the Table 2 minimum heights of the energy barriers to the decay and bond lengths between the carbon atoms of the ruptured C-C bond for the saddle configurations for some substituted prismanes are shown. Table 2. 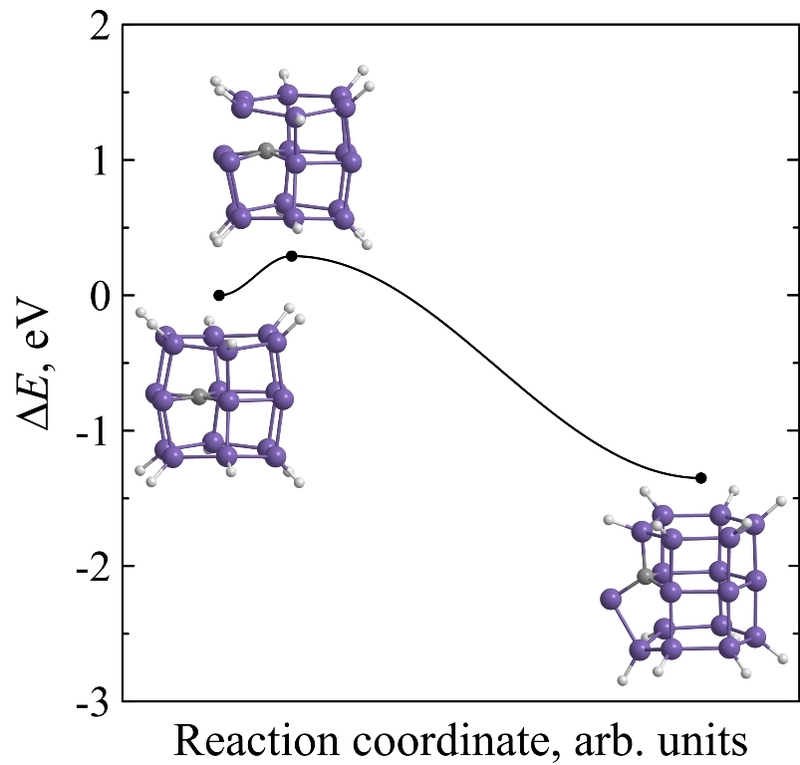 Minimum heights of the energy barriers U to the decay and bond lengths l TS between the carbon atoms of the ruptured C-C bond for the saddle configurations of substituted tri- and tetraprismanes C2mH2mR. 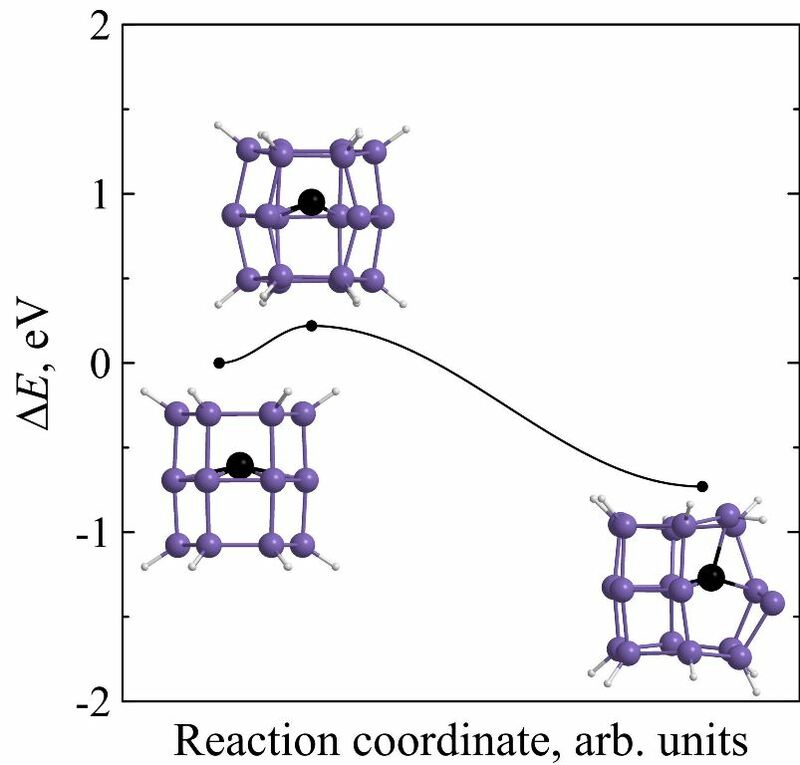 Interesting behaviour is found: less bond length lTS corresponds to the lower energy barrier U.
Polynitrocubanes C8H8-q(NO2)q (PNC) are the cubane derivatives, in which one or more hydrogen atoms are replaced by NO2 groups. Similarly, polymethylcubanes C8H8-q(CH3)q (PMC) are the cubane derivatives, in which methyl groups substitute hydrogen atoms. The latter and the former are the perspective functional materials. Figure 3 shows octanitrocubane and octamethylcubane molecules. Using the NTBM model the minimum heights of the energy barriers preventing the decay of some PMC were determined (see Table 3). 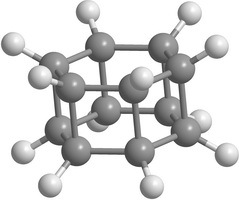 It is shown that even one methyl group reducts the stability of the cubic carbon cage, but further increasing of CH3-groups makes the carbon framework more stable. Table 3. Calculated values of the minimum energy barriers U (eV), preventing the destabilization of the PMCs cubic cage through the C-C bond rupture. X and Y are numbers of carbon atoms of the ruptured C-C bond (the numbering of atoms see at the inset). lX-Y (Angstroms) is the minimum distance between these atoms, leading to irreversible decay of PMCs cubic cages. 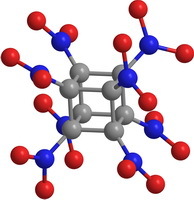 Generally speaking, it is found that methyl groups destabilize the cubic carbon cage, but less than nitro groups. 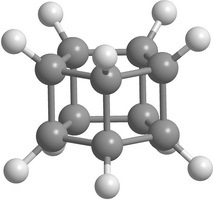 Hypercubane C40H24 (HCUB) has Oh symmetry like classic cubane C8H8 and is characterized by double-shell architecture: C8 cubic core is located inside high-symmetry carbon cage (see Figure 4). 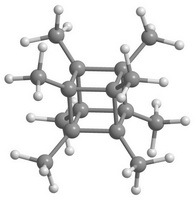 The initial model of HCUB was constructed from octamethylcubane by removing unnecessary hydrogen atoms and adding the ethylene bridges as well as intercarbon bonds between the sp2 and sp3 atoms. The results obtained via the NTBM model on the numerical simulation of the dynamics of hypercubane C40H24 indicate that HCUB possesses high thermal stability comparable with classic cubane C8H8 . As for its final decomposition products, they are airscrew-like hydrocarbon based on three combined graphene fragments passivated by hydrogen atoms and three isolated acetylene molecules. So, one of the possible ways for HCUB synthesis may be realized at ultrahigh-pressures using graphene fragments and acetylene molecules as precursors. Using the NTBM model we obtain structural, energy and some electronic properties of [n,em>m]prismanes with large n and m. Examples of traditional "long" polyprismanes are shown on Figure 5. Figure 5. 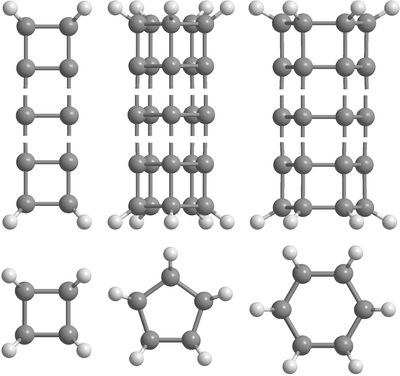 Structures of the [n,4]-, [n,5]- and [n,6]prismanes. Top - side view, bottom - top view. The data of numerical simulation obtained in the frame of NTBM model indicate an increase of thermodynamic stability of polyprismanes as the number of layers n increases. In contrast to binding energies, HOMO-LUMO gaps decrease as the effective length of polyprismanes increases (see Figures 6 and 7). These values in the bulk limit ( n → ∞) are near to the upper limit of characteristic semiconducting value, therefore it is become possible to tune electronic properties of the polyprismanes by doping or mechanical stresses that will be useful for nanoelectronic applications. Figure 6. 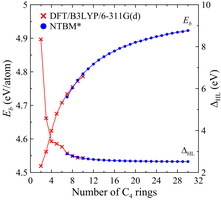 Binding energies and HOMO-LUMO gaps versus the number of C4 rings obtained at the DFT/B3LYP/6-311G(d) (crosses) and NTBM (circles) levels of theory. Figure 7. 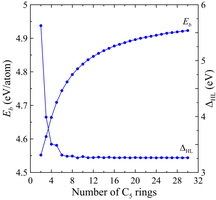 Binding energies and HOMO-LUMO gaps versus the number of C5 rings obtained within the NTBM model. Using ab initio calculations it is found that endohedral complexes C@Si18H12, Si@Si18H12 and Ge@Si18H12 are less kinetically stable than pure [3,6]silaprismane Si18H12. 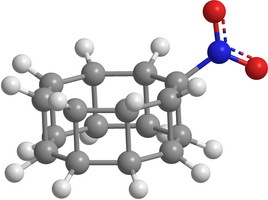 Moreover, kinetic stability of Si18H12 is higher than the stability of its carbon molecular analogue C18H12. The height of the minimum energy barrier preventing the Si18H12 isomerization is found to be 1.09 eV and its lifetime at room temperature will reach several hours that is acceptable not only for its immediate experimental observation but for the laboratory synthesis without using the extreme temperature conditions as well. Figure 8. Potential energies ΔE of C18H12 (a), Si18H12 (b), Si@Si18H12 (c), Ge@Si18H12 (d), and C@Si18H12 (e) molecular systems along the reaction coordinate during the framework decay. The insets show the transition state and molecular configurations corresponding to the local minima. 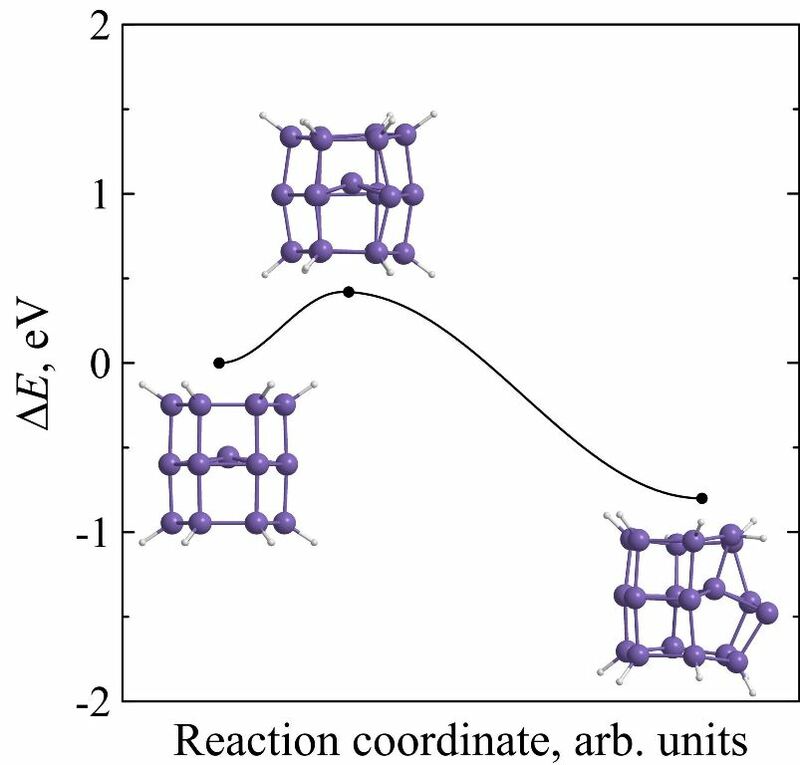 Tight-binding molecular dynamics simulations are carried out to analyze the thermal stability of the carbon [n,5]prismanes with n = 2 - 4 over a wide temperature range. 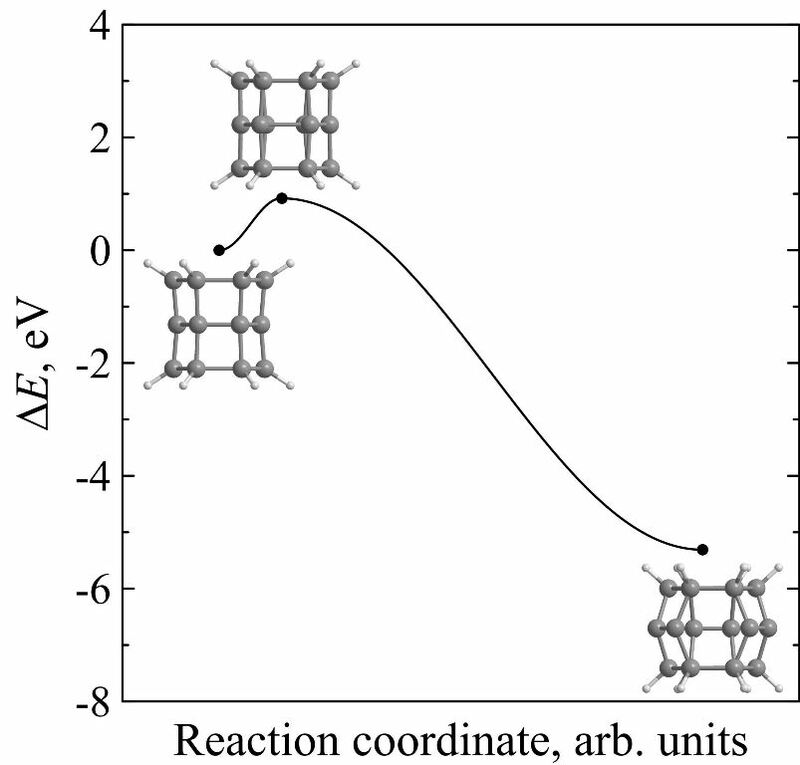 The results obtained demonstrate that the isomerization activation energy as well as the frequency factor in the Arrhenius equation of these metastable nanostructures rapidly decreases with an increase of n. Therefore, the increase in the effective length of [n,5]prismane leads to the decrease in its lifetime up to the moment of its isomerization. 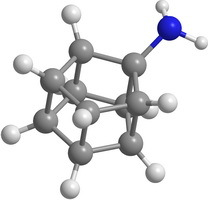 Nevertheless, the stability of [n,5]prismanes is confirmed to be sufficient for their existence at the liquid-nitrogen temperature. The main identified mechanism of [n,5]prismanes isomerization is the interlayer C-C bond breaking leading to their transformation to the hypostrophene-based molecular systems. Figure 9. The lifetimes τ of [2,5]-(circles), [3,5]-(squares), and [4,5]prismanes (crosses) up to their isomerization versus the inverseinitial temperature T-1. Circles, squares, and crosses are the results of calculation, solid lines are the corresponding linear approximations obtained by the least-square method. 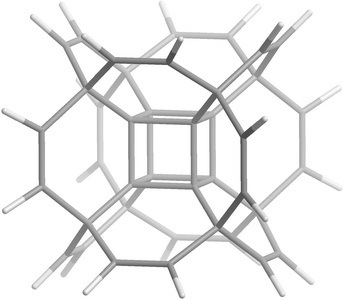 Polyprismanes are quite promising compounds. For example, polyprismanes can be functional nanowires with controlled electronic characteristics and can be used in computational logic elements. 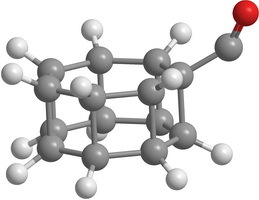 The incorporation of metastable carbon-nitrogen structures (nitrogen chains) inside the higher polyprismanes can stabilize the latter, which will make it possible to obtain an efficient high-energy material. The same principle of the formation of endohedral complexes (the encapsulation of therapeutic preparations inside polyprismanes) can be used for developing drug delivery systems in the field of nanomedicine. The use of polyprismanes as elements of measuring equipment, such as probes (tips) of the atomic-force microscopes, is also urgent. 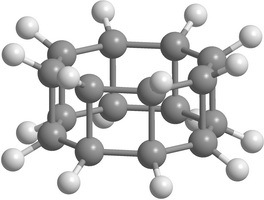 The absence of free covalent bonds makes polyprismanes insensitive to contaminants of the external medium (free radicals), which lowers the reaction ability of the tip making it possible to attain atomic resolutions in a microscope. Pillared graphene is a well-known hybrid carbon, structure consisting of an oriented array of carbon nanotubes connected at each end to a sheet of graphene. In the frame of this study we suggest a new carbon allotrope, which is based on the prismanes and graphene sheets. At Figure 10 the fragment of "prismaned graphene" consisting of two graphene layers and [3,6]prismane is presented. Note that owing to Stone-Wales defects on the graphene not only [n,6]prismanes can be used in "prismaned graphene". For example, [n,5]- or [n,7]prismanes are also good candidates for the carbon hybrid suggested. 6. Katin K.P., Maslov M.M. 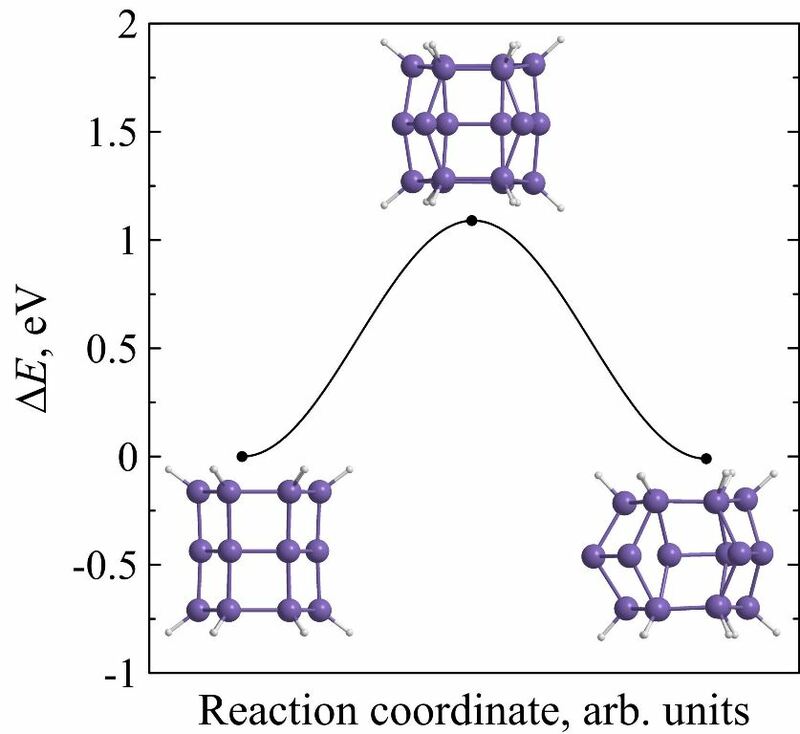 Thermal stability of carbon [n,5]prismanes with n = 2-4. // Submitted to Modelling and Simulation in Materials Science and Engineering. 2017. The reported studies was partially supported by RFBR, research project No. 15-32-20261 mol_a_ved.